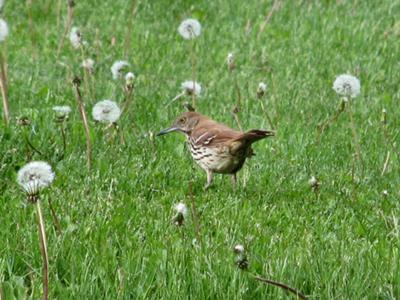 Every spring we listen to the male Brown Thrasher sing for hours on end. He mimics every other bird species, usually repeating each call two to three times (similar to the Mockingbird). They are ground nesters and we often see him disappear into the field behind our house, so I assume that is where they're nesting. 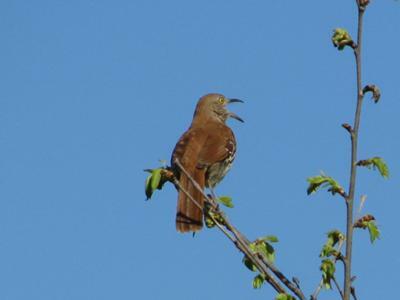 I think all that singing is during courtship season because after a few weeks of it we don't hear him, but see a pair foraging in the yard for insects most of the summer. Thank you Charlene, for this report and great pictures! I know our readers and Facebook followers will enjoy your pictures and report, as much as I do, so I will also post this on our Facebook page.